A Promissory Note is NOT Hearsay - В сложной финансовой ситуации приходит на помощь кредит наличными в Казахстане. 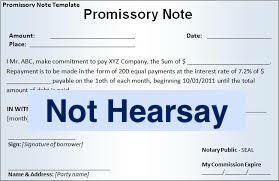 A promissory note is NOT regarded as hearsay. This means a party introducing a promissory note does not need to lay down the foundation to a hearsay exception such as the business records exception in order to admit the note into evidence. The Fifth District Court of Appeal in Deutsche Bank National Trust Co., Etc. v. Alaqua Property, Etc., 41 Fla.L.WeeklyD994b (Fla. 5th DCA 2016) explained that a promissory note in a foreclosure action is NOT hearsay because it is NOT being offered to prove the truth of the matter asserted; rather, the note has independent legal significance, that being “to establish the existence of the contractual relationship and the rights and obligations of the parties to the note.” Deutsche Bank National Trust Co., supra.